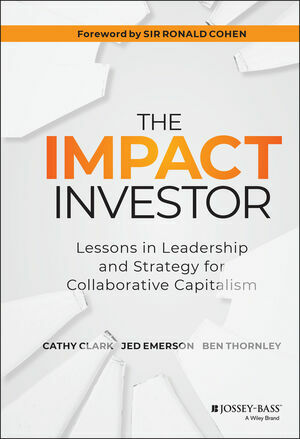 The Impact Investor: Lessons in Leadership and Strategy for Collaborative Capitalism offers precise details on what, exactly, impact investing entails, embodied in the experiences and best and proven practices of some of the world's most successful impact investors, across asset classes, geographies and areas of impact. The book discusses the parameters of impact investing in unprecedented detail and clarity, providing both context and tools to those eager to engage in the generational shift in the way finance and business is being approached in the new era of Collaborative Capitalism. CATHY CLARK is director of the CASE Initiative on Impact Investing (CASE i3) and a professor at Duke University’s Fuqua School of Business. She also co-leads the Social Entrepreneurship Accelerator at Duke, part of USAID’s Higher Education Solutions Network. She is a leading authority on for-profit social entrepreneurship, impact investing, and impact assessment. JED EMERSON is senior advisor to three family offices, each of which is executing 100% impact/sustainable investment wealth management strategies. He is also chief strategist of ImpactAssets and a senior fellow with the Centre for Social Investment at Heidelberg University. BEN THORNLEY is the founder and managing director of ICAP Partners and a strategic advisor to REDF and Pacific Community Ventures (PCV). He created the Impact Investing Policy Collaborative at PCV, with partners from Harvard University, and consults with CalPERS and other leading financial institutions on the social and economic impacts of over $25 billion of targeted investments.